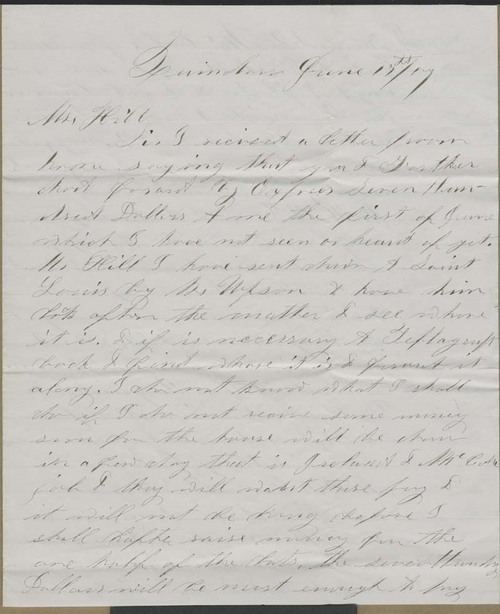 Albert Morton wrote from Quindaro, Kansas Territory, to Hiram Hill in Massachusetts, concerned that he had not yet received $700 which Hill had recently sent to him. Morton also sought Hill's approval regarding the sale of a town lot with a house on it, the profits from which would be better used, Morton thought, in land investments. He also expressed concern that the railroad decide to pass through Quindaro, fearing that, if it didn't, it would "set things back."